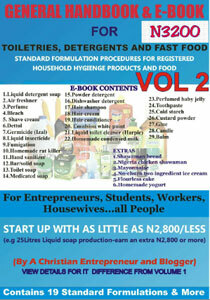 A general handbook and step by step guide on how to make toiletries, detergents and Nigerian fast food. The Author, Ojewale Funmilola, a graduate of biochemistry from Bowen University, Iwo inOsun state, and currently an entrepreneur with first hand experience in the production of all that is stated in her book. This act alters the provisions of the 1999 Federal Republic of Nigeria constitution. Also contains citations. This act further alters the provisions of the Federal Republic of Nigeria for the establishment of the National Industrial Court under the constitution. Also contains citations. The Orthographic Assimilation of Nsibidi Ideograms. Zamfara State approved budget of the year 2015. 2015 budget of Rivers State, Nigeria. Bauchi State approved budget of the year 2015. Published by Njoku and Sons Bookshop.This booklet examines the lifestyle of the youths in the 1960s. The author gives his opinion on how trashy music and club women have corrupted the young men in Nigeria. Central Bank of Nigeria statistical bulletin for the year 2009. 2016 Federal Government of Nigeria appropriation bill/ budget proposal. ''Cocktail Ladies'' is a compendium of a series of broadcast by Mr Nkwoh on Eastern Nigeria Broadcasting Corporation.It was part of the Community Social Register programme which analysed social behaviour of the nigerian society in the 1960s. Kano state approved budget for 2015. Lagos State House of Assembly Approved 2016 Budget. This act alters the provisions of the Federal Republic of Nigeria constitution and the first alteration act. Also contains citations. Central Bank of Nigeria Economic Report for the year 2012. The complete 1999 constitution of the Federal Republic of Nigeria, from chapter I to chapter VIII with schedules and parts intact. Edited by SNIPPARZ EFX.